This month I finally started reading some of the books that I swear are more than colorful decorations on my bookshelves. I need to do this for my own sanity, and maybe one day I will be able to say that yes, I have in fact read most – if not all – of the books I own. What? A girl can dream! He had been happy for a minute, he thought. That was his mistake. It has been a while since I read Heartsick, the first book in the Archie Sheridan/Gretchen Lowell series. But even though there has been a long stretch of time in between my reading of these two thrillers, anyone who meets Gretchen Lowell would find it hard to forget her. But that’s something that Archie Sheridan clearly already knows. He’s never been able to forget Gretchen – even after she abducted him, held him as her prisoner for 10 days and carved him up pretty good during that time too. The drills did not take into account Gretchen Lowell. She was predicatable. She would kill until someone stopped her. Yes, indeed. With just that one sentence, Cain says enough to let us know that the ish is about to hit the fan in this book. Archie is just a teensy bit obsessed with Gretchen, still. And her escape not only puts him back between her crosshairs, but it also endangers his family and anyone else he’s close to. Sin is rearely without complication. Sweetheart is the second book in its series and one that I had been meaning to read for a very long time. Gretchen Lowell is a scary-as-hell, uncommon enemy. She is cunning and is 100% invested in the long-game. Archie Sheridan is… complicated. He’s dealing with a healthy dose of PTSD from his last encounter with Gretchen, The Beauty Killer, and really can’t be held accountable for his own actions. (That’s me making excuses for some of his crazy choices in this book). It’s fast-paced, definitely thrilling, and packed with characters that will attach themselves to you on so many different levels. They’re smart and stupid, loyal and deceptive, perfect and flawed, innocent and dangerous. Fans of crime thrillers – especially those featuring prolific serial killers – should definitely not miss this series. I’m looking forward to reading the next book, Evil at Heart. 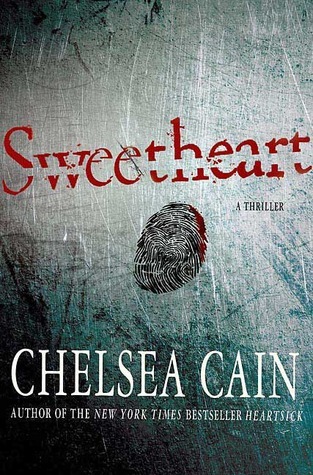 Chelsea Cain is the New York Times bestselling author of the Archie Sheridan/Gretchen Lowell thrillers Heartsick, Sweetheart, Evil at Heart, The Night Season, Kill You Twice, and Let Me Go. Her book One Kick (August, 2014) is the first in her Kick Lannigan thriller series. Her book Heartsick was named one of the best 100 thrillers ever written by NPR, and Heartsick and Sweetheart were named among Stephen King’s Top Ten Books of the Year. Her books have been featured on HBO’s True Blood and on ABC’s Castle. Cain lives in Portland, Oregon with her husband and daughter.